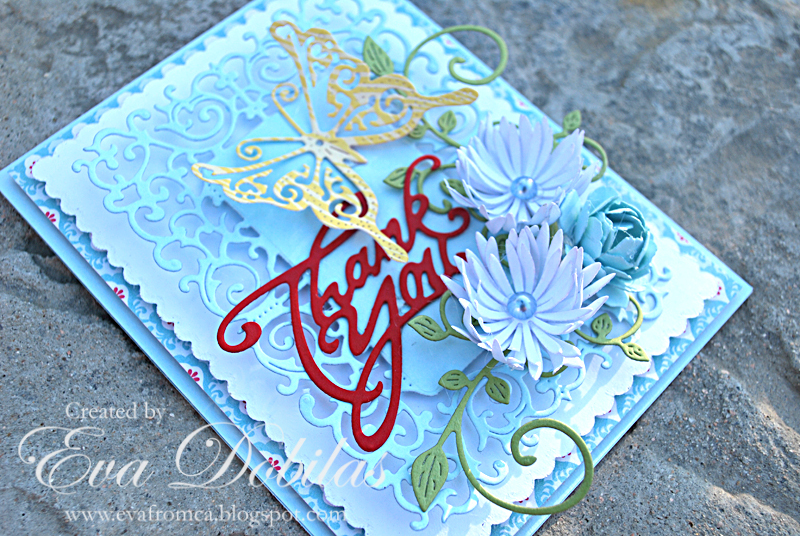 Hi there, I am here today with a pretty card using our color scheme challenge from this week's Cheery Lynn Designs dies. I first started my card with an A2 size card base and cut a slightly smaller patterned paper to layer on top of it. Than I cut a larger A2 Frames Rectangular Scalloped using white card stock and layered it on top. I die cut an Alpine Flourish Doily using aqua color card stock and layered it on top of the white panel. Die cut two Chrysanthemum Strips to create my two flowers and one Tea Rose Medium and created my flowers. I also die cut a Mini Fanciful Flourish Right and a Mini Fanciful Flourish to create my floral element of my card. I die cut a Thank You #2 out of red card stock and added it to my card and finally die cut a Small Exotic Butterflies #2 out of yellow patterned paper and added that as a last touch to my card.